To celebrate the release of People, Hell and Angels, Matt Domino takes a look at what might have happened had Jimi Hendrix lived. Last week, the new posthumous Jimi Hendrix album, People, Hell and Angels, was released worldwide. This album is not a revelation; at this point, through the variety of unreleased material that has surfaced over the years, we know more or less what Jimi Hendrix was up to at the time of his demise. Though we know that Jimi Hendrix died on September 18, 1970, what we are going to do in this piece is, to paraphrase Eli Cash, presuppose that he didn’t. Yes, that’s right—we are going to look at an alternate timeline of Jimi Hendrix’s music career to see what would have happened had he made it past twenty-seven. We’ll do Part 1 today and then Part 2 next week. 1. I am going to try to stick to the “Doc Brown Rule” of not altering the past too much. Obviously if Jimi Hendrix had lived, he would have altered certain parts of music history in dramatic ways, but we can’t get into all kinds of “rock god fan fiction” here, alright? I’m just trying to make an easy to read timeline. 2. We are going to skip over some years and periods of time. Look, this isn’t the World’s Coolest Dude list, we can’t go into endless detail of what happened in each specific year and why. 3. I think those are all the disclaimers I have actually. Yeah, that’s it. Now that those are out of the way, let’s take a look at what would have happened had Jimi Hendrix not died on that fateful September day in 1970. Hendrix’s new energy is infectious and Cox and Mitchell are able to conjure some of the chemistry the group had started to develop during their short-lived European Tour at the end of the previous summer. Drawing on the sounds from the Band of Gypsys live album and some of the working tracks from First Rays of the New Rising Sun the band record through the holidays and into the New Year. At thirteen tracks, the album just missed being a double album. It opens with the psychedelic and druggy “Room Full of Mirrors” before segueing into “The Burdons” (a pun on "burdens"), which features Jimi alone on guitar, singing his most directly confessional song to date. Those two diametrically opposed tracks set the range for the rest of the album, which included re-recorded versions of “Freedom” and “Night Bird Flying.” During the middle of the album Hendrix, clearly influenced by the Band and the English Folk scene, veers into a more laid back stretch featuring songs like “Hudson Sunset,” “First Rays of the New Rising Sun,” “Islands of the Earth,” and a re-recorded cover of “Angel.” The album’s resonance came from the last two songs, a studio version of “Machine Gun” and the title track. “Machine Gun” in studio was a vastly different than its live incarnation with much of the fury turned inward. It presaged the tone and guitar work that Neil Young would do during his “Ditch Trilogy” and on Zuma. It was a song that contained the power and pain of the incendiary live version, but honed it into a more mature expression. I hope to see you in the end. From there, the guitar enters and the lyrics slowly fade out as the guitar rises and leads the band in a triumphant march. The guitar soars and quotes from “Axis: Bold as Love” and “Are You Experienced?” before turning into distortion that slowly fades away. September 1971: After a summer of touring behind the new record, Hendrix holds a small party in London to celebrate his growth since he bottomed out the previous year. David Bowie attends the party and he and Hendrix go from being rock royalty acquaintances to close friends after that night. May 5, 1972: After recording stalls, the record is finally released. Entitled, Cities of the Future, the album is sprawling and more unfocused than Era’s End. It is much more steeped in blues than it is glam—and the blues tracks are stronger. In between those two poles are short song fragments featuring Jimi singing over piano. 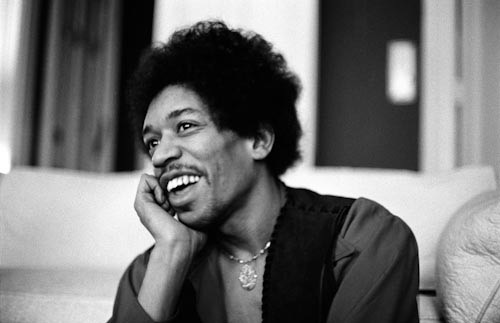 The album sells based on the strength of the glam single “Subway Shine,” but overall it is agreed that it’s Hendrix’s first “less than stellar” release. December 6, 1972 — In between legs of Bowie’s Ziggy Stardust Tour, Hendrix and Bowie take up residency in London’s Trident Studios where Bowie begins work on Aladdin Sane, the follow up to Ziggy Stardust, while also helping to “engineer” Hendrix’s next album. Sharing personnel, the studio sessions begin to take on the air of a party with cocaine and alcohol use running rampant. Bowie begins the sessions being very generous with his attention and time towards Hendrix, but with the pressing demands placed on him with recording a follow up to the wildly successful Ziggy Stardust, he begins to turn inwards and away from the Hendrix project. February 20, 1973 — After a two week break in sessions, Hendrix returns to the studio determined to finish recording the album. George Harrison, in London finishing Living in the Material World, comes by the studio to help with production, applying some of the techniques he had been using in his work with Phil Spector. George is a calming influence on Jimi and in a few late night sessions (fueled by cocaine) helps Hendrix edit down some of the material. They decide the album will have two sides: Side A will be funk and jazz with the recorded brass arrangements, while Side B will be re-recorded versions of some of the more traditional “Hendrix” songs Jimi had been working through. March 24, 1973 — Bowie returns from America before going to Asia to start another leg of the Ziggy Stardust tour. He is aloof towards Hendrix while at the studio and the two don’t interact very frequently. However, his return brings back many of the distractions from the earlier sessions. Hendrix, who had curbed down his cocaine use over the past few weeks, begins using the drug once more with vigor in an attempt to focus and finish the album. April 21, 1973 — With Bowie finishing up the Asian leg of his tour and scheduled to come back to London in the next few days, Hendrix makes a push to finish the album. He obsesses over his guitar sound and becomes especially fixated on the drums. After bringing in a variety of drummers, he finally convinces Mitch Mitchell to come and finish the sessions with him. The studio staff, frustrated by the long hours and Jimi’s general disorganization and lack of decision making, threaten to abandon the project. Hendrix takes the reigns and he and Mitchell are able to “complete” recording. June 21, 1973 — After painful mixing and mastering sessions where Hendrix threatens to re-record the drums for the entire album, the record is finally released. Entitled, Beginning of the Bar, the album is received to mixed reviews. Many claim that while the instrumentation on the first side is excellent, that the production sounds muddy and that overall the tracks lack any true focus and don’t ever find an actual groove. Rolling Stone write, “It falls in some no man’s land between War and Miles Davis’ On the Corner. The title track grooves and entices, but after that the album zigs when it should zag—and not in the meaningful way.” The second side is better received. “The closer Hendrix gets to the blues the better,” says MOJO. This side features the album’s single, “Agent Orange,” which is a part ode and part Dylanesque character assanination on David Bowie. The single makes the Top 10, but the album barely makes the Top 40. June 22, 1973 — After a fight with his wife, Hendrix goes out partying. He overdoses on cocaine and is taken to a hosptial and survives. March 28, 1974 — Anne Hathaway Hendrix gives birth to Jimi Hendrix’s first child, a daughter named Marguerite Annabelle Hendrix. January 31, 1975 — Jimi Hendrix attends a Seattle Supersonics game. The Sonics are hosting the Portland Trailblazers and their young, superstar center, as well as known Grateful Dead and music fan, Bill Walton. The Sonics defeat the Blazers 106-103 with Walton scoring 21 points. After the game Walton and Hendrix are introduced. Walton is enthusiastic and bashful at the same time. At one point he giddily asks Hendrix, “Are you coming back to music?” Hendrix asks Walton if he thinks he should, to which Walton replies. “You’re the best. It’d be like this league with out Kareem!” Hendrix laughs and responds, “You’re a cool kid. I’ll think about it.” Before Hendrix leaves, Walton has him sign his sneaker. May 1, 1976 — Anne Hathaway Hendrix gives birth to Jimi Hendrix’s second daughter, Lily Zenora Hendrix. November 25, 1976 — The Band hold the Last Waltz concert at the Winterland Ballroom in San Francisco. The concert is to serve as the band’s farewell. Dylan is scheduled to join the Band for a set. During the set, after the Band and Dylan run through “Forever Young” into the “Baby Let Me Follow You Down” reprise, Dylan and Robbie Robertson welcome Jimi Hendrix onstage to join them. Jimi plays “All Along the Watchtower” with Dylan and the Band. The band cover Dylan’s version of the song, with Dylan singing the vocals, but they encourage Jimi to solo and he obliges. After the song, the crowd won’t settle down until Jimi says something. He goes to the microphone and says only, “Thank you,” before waving and then walking off. February 8, 1977 — Hendrix’s longtime friend Chas Chandler visits Jimi in Washington. As a gift, he gives Jimi the debut album by a new band called Television. Chandler and Hendrix listen to Marquee Moon and Jimi is enthralled by the sound of the record as well as the guitar playing. Once Chandler leaves, Jimi continues to listen to the record obsessively. One evening, after staying up late, listening to Marquee Moon and practicing guitar, Jimi goes to bed and lays down next to Anne. After a few minutes of lying in bed, he turns on the bedlamp and gently rubs Anne’s shoulder, waking her. She turns, brushing her straw-colored hair from her eyes. Hendrix puts his hand to her cheek. He looks at her, looks past her, looks back to her eyes.